Depending on where you live, the changing of the seasons is right before us. The warmer tones and natural colors that come with fall provide such a stunning display of God’s nature changing as we transition into winter. 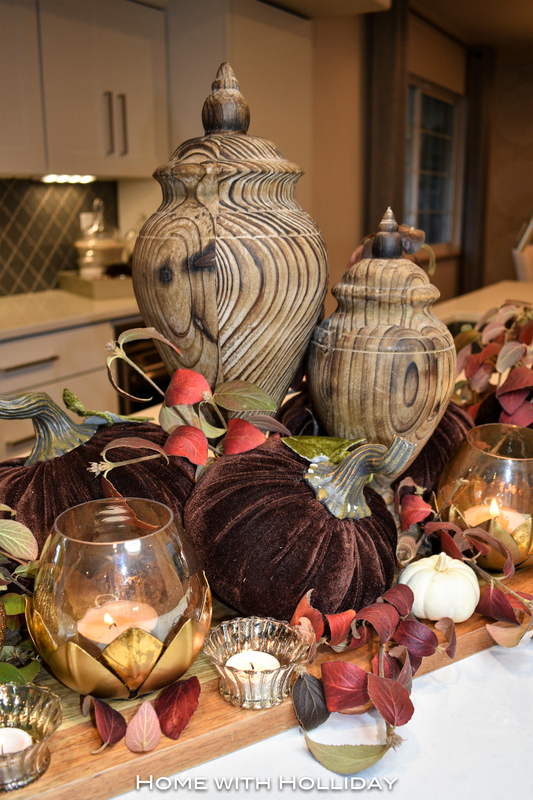 I love decorating for fall so I have been compiling several creative ideas for fall or Thanksgiving table settings and home decor to provide inspirations for you as you plan your fall decor. There are five different suggestions here that can help you create your own fall looks for multiple areas in your home. Grab a coffee or a glass of wine and settle in. This post is full of so many beautiful and creative ideas from fellow talented bloggers with a few thrown in here from me. Last week, I shared a post of mine offering some Simple Ideas for Fall Table Settings, so you might want to check that out also. This post contains affiliate links for your convenience that help me keep the blog up and running. A neutral color scheme fits in well with most home decor styles, whether formal or casual. A neutral palate also helps achieve a very natural look, if that is what you are trying to achieve. Using a neutral palate provides such a soft and inviting look. This light and neutral centerpiece add a beautiful touch of elegance to the table setting. There are so many fruits and vegetables that coordinate so nicely with fall decor. Additionally, this can be an inexpensive way to achieve drama without breaking the bank. They also add nice texture and can be reused….bonus! This simple centerpiece is loaded with vegetables and is so happy! The natural fruit and vegetable elements here are so simple and bright providing dramatic texture. This table setting just screams “FALL”!! So many amazing touches. I love the brightness these pomegranates provide. I am sure this seems obvious, so here I am sharing some of my favorite table settings that include pumpkins and/or turkeys. The browns and rusts work together so well here. The abundance and varieties of pumpkins really make this look. Be sure to notice the opened books being used as a base for the place settings. So creative! These pumpkins really stand out in this elegant and colorful table setting. The turkeys here add so much fall texture and color and the tones for the color palette of the place settings. This is one of my table settings from last year…it was actually the “kids table”. The brown velvet pumpkins definitely steal the show for this table setting of mine…as do the green metal pumpkin party favors. The jewel tones of the table setting are so cozy and warm. This turkey-themed table setting is just so delightful and happy! Great for a brunch or luncheon. I think this has to be my all-time favorite table setting decorated with pumpkins. I am so in love!! It is so romantic and fresh. And, an unexpected color palette. Isn’t this so divine?! These natural elements could include pine cones, antlers, cinnamon sticks, magnolia leaves, moss, feathers, leaves with changing colors or tree branches. I love the use of the feathers here! So simple and elegant. Adding antlers to this centerpiece really takes it up a notch. The large pine cones and feathers finish off the look of the vignette so nicely! My planter filled with preserved moss provided the natural greenery for this centerpiece and offered really nice contrast and softness. For this fall centerpiece for my island, I cut this foliage off of one of my bushes in my yard right as the colors where changing. It added great texture and warmth in my white kitchen. The blankets and throws used here in the next several table settings make you just want wrap yourself in them. Since I do not know where these bloggers acquired their blankets/throws for these table settings, I shopped some for you and these are my favorites for creating a similar look. Thanks for sticking with me to see all of these amazing inspirations with creative ideas for fall or Thanksgiving table settings and home decor. I am dying to know which one was your favorite!? Let me know in the comments below. To receive notices for my upcoming posts, please subscribe to my blog for instant email notifications. Also, stop by my Pinterest page for more inspirations for decorating for fall and Thanksgiving. Wow, everything is so beautiful! I want to shop for it all! Thanks for the ideas. Pinned! Thank you Carolann! I am so glad you stopped by and liked it! I also really appreciate the pinning! Have a great evening! Thank you so much! I just love your “name”!! I couldn’t believe how many Christmas decorations were already out! It is crazy!! Have a great day BB2U.